How long have you been working in the industry? I’ve been working in the hotel industry for over 18 years. I started as a part-time Page Boy. The role of the Page Boy back then was pretty simple: you open the door, you smile and greet the guests, and you assist the guests with their bags. Sometimes you might have to send messages or faxes to the guests’ rooms. And you might also have to walk around the hotel lobby to clear and replace ashtrays. What inspired you to join the industry in the first place? It was through a part-time job that I developed an interest to work in a hotel. I liked being able to meet different types of people all the time. But what made me really want to join the industry was the Chef Concierge back then – who wore the same Golden Keys that I wear now. He had an impressive charm and aura, and people always went to him for advice or to get something important done. So I asked around and found out who he was, and what the Golden Keys stood for. That was when I knew that I wanted to be like him – I wanted to wear the Golden Keys as well, because it’s a prestigious international symbol of excellent service. Was that why you decided to become a Concierge? Yes, but when I applied for a full-time position as a bellman, I was asked to apply for a front office position instead. The interviewers tried to convince me to join the front office instead by telling me that I’d get paid more, and that I was overqualified to become a bellman. But I told them that my dream was to become a Concierge, and to get those Golden Keys. I knew I couldn’t become a Concierge right away, which was why I wanted to start as a Bellman, and I wouldn’t accept any other job. Thankfully, I was hired as a Bellman. I worked as a Bellman for just 3 months. The day my probation period ended, I was promoted to Bell Captain. After a couple of years, the Chef Concierge gave me the opportunity to work as a Concierge. I worked with him for seven years, and he was a mentor to me. Finally, in 2005, I was accepted as a member of Les Clefs d’Or, or the Society of the Golden Keys. It was like a dream come true for me. How did you then become the President of Les Clefs d’Or? My dream was to only get the keys. I didn’t expect to become the President. But my mentor and my wife encouraged me to step up and do more. So I ran for office during the elections and thankfully, the other members of Les Clefs d’Or voted for me to become the President. It came with a lot of added responsibilities but I appreciate the faith that the members of Les Clefs d’Or had in me and I didn’t want to disappoint them. As President, I have to travel about three times a year to represent Singapore at meetings. I get to meet the other presidents from other countries. It gets a little intimidating but it’s an eye-opening experience. How do you make a guest’s stay more enjoyable? First, you have to greet your guests by name. That way, you get to form a connection with your guests. You also cannot be an introvert. You need to talk to guests, ask them about their day, and do whatever you can to make their stay better. For all you know, they might become a friend. I’ve only been here at the InterContinental Singapore for 2.5 years but a lot of the regular guests here already have my direct contact, so they can get in touch with me anytime they need to. What are your daily responsibilities at the hotel? 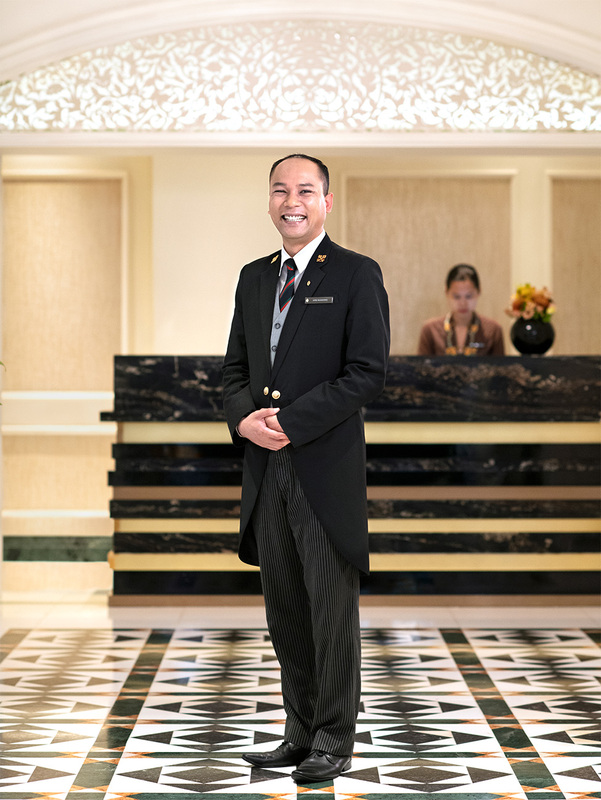 As a Chef Concierge, or chief Concierge, I manage a team of about 15 people at InterContinental Singapore – the valet, the doormen, the bellmen, and the other Concierges. So every day, I check who the VIPs or regular guests for the day are, and whatever requests they may have. And I’ll try to be there to greet them when they enter or leave the hotel. Apart from that, I’ll be at the lobby, assisting guests with whatever they may need. I also use the time to speak to guests to get their feedback, so my team and I know what we can do to make their stay even better. That way, we can make sure that every guest will depart with a good impression and happy memories. What do you love most about what you do? I look forward to coming to work every day because I have a purpose: I want to make people happy. This is my passion, and if I can make an impact on a guest’s stay with us, or make his visit a memorable one, I see that as fulfilment. Are there any challenges that you face in your line of work? Sometimes, a simple request may not be as simple as you think. For example, if a guest says that he wants to go to an Italian restaurant, you can’t just list random Italian restaurants in the area. We have to find out more about the reasons behind the request. Is there an occasion? How many people are attending? Is it for lunch or dinner? What type of ambience is he looking for? What’s the budget? And while you’re asking those questions, you’re slowly eliminating possible options until you have the best recommendations that fit all their criteria. And of course, once he comes back from wherever he went, we’ll ask him about the experience. As Concierges, we take pride in our recommendations. So we want to make sure that we had given the right recommendations, so we can give good recommendations to other guests in the future. He wanted to propose to his girlfriend, but he only gave me two days to prepare. He didn’t have a fixed guest list, nor did he have any restaurant or location in mind. He left it completely to me. The only thing he was going to prepare was the ring. So I prepared a banner, and I made an order for 100 balloons. I also managed to find a restaurant with a great view of Marina Bay. I got in touch with about 30 of his friends, and told them the plan. Upon my signal, they opened up the “Will you marry me?” banner that I had made, and when she said yes, we released the balloons. They have a daughter now. Every time they come to Singapore, they’ll come by to say hello. It was quite memorable, because I didn’t just impact their stay – I played a role in making an impact on their lives. Any words of advice for someone who wants to become a Concierge? If you want to become a Concierge, you have to be confident and knowledgeable. You need to keep up with current affairs and always keep up-to-date so you can better help your guests and give them the right recommendations. You also need to have a keen eye for detail in everything that you do. Lastly, you have to work as a team. One person can’t do it all. We have to work together with others in order to achieve our goal of making our guests happy.